My Honda Moped Express NC 50 is LEAKING GAS! What the heck? I have been riding my Honda moped to and from work (20 miles) for a number of days now. Granted my '78 Honda Express is 31 years old and problems are to be expected, but things were going so well. Here is the deal. As soon as I had the Express in my yard and it was parked, I noticed that gasoline was litterally pouring out of a hose that connects to the Honda Express carborator and snakes down to below the engine. This tube serves as an "over-flow" for the bowl in the carb. So, if too much fuel is in the carb it has somewhere to go. Well, I rotated the switch on the petcock from ON to OFF and the fuel stopped flowing out the rubber tube. It was going to completely drain my tank of fuel had I not done that. That took care of the immediate problem, and now I had to find a solution. "Just bought a 1981 NC50 about a week ago. It starts right up and runs great. However, gas keeps running out of a small tube underneath the engine, in front of the kickstand. I first noticed it when I turned off the engine after riding it. It stops if I turn off the fuel valve. Is this normal? If not, how do I fix it?" 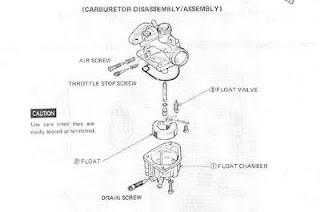 After reading several of the posts, it seems that I might need a new express carburetor float, float pin, or mounting screw. I will have to open up the Honda NC50 carb to tell. I also need to find out where to purchase these parts... cheaply! You can get a set of all these for the rip-off price of $60 with shipping on Ebay... OUCH! "So, I was dumb and didn't know that the cylinder thingy had grooves on it so your advice helped me, I just pulled it out, I was lucky I didn't damage it. The original problem was that I was leaking gas out of the carb. The needle wasn't closing off the seat. The pin that holds the float was bent so when it would sit one way it wouldn't push the float up to close the seat. We fixed it for a day because we just happened to put the pin in so that it laid well enough to close off the seat. We straightened out the pin and now it closes off that seat. It was frustrating taking that carb apart 10 times. Each time we thought we fixed it then wed get it all back together, turn her on and it would just pour gas out. Glad its fixed." I am hoping once I get the carb open I will have a better understanding of what is actually malfunctioning. I will be sure to post photos of the process for others. Wish me luck! 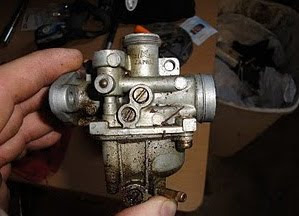 You can find my next post of repairing/cleaning my 1978 Honda nc 50 Express carburetor here.